The Taxes and Utility payment option can now be found at the top of the Links Page! Maryland Mandate- Fire Sprinkler Installation- A MUST read for builders/contractors/developers. See Public Notices for Full Ordinance and installation provisions. Public Announcement- Town of Delmar's Safe Routes to School Project has been given approval to proceed to the "project construction phase" For more detailed information please click on "Public Notices" and click on Safe Routes to School. Monday, April 22, 2019- The Public Works Staff will be working with AM Liner to video some infrastructure underground on Third St. The roads on East St., Third St., and some of State St. will have some partial lane closures between 10:00 a.m. and 12 Noon. We apologize for any inconvenience this may cause. If you have any questions, please contact the Public Works office at 302-846-3696. Town of Delmar Cook Books are in !!! Thank you to everyone who contributed family recipes and who sponsored our book. The cost of the cookbook is $10.00. The Town will be set up at The Day in the Park where they will be on sale. The books are ready for sale now at Delmar Town Hall. Call 410-896-2777 or 302-846-2664 to arrange payment and shipment if needed. The cookbooks are a fundraiser for the Town's yearly Heritage Day celebration held in September. We, at the Delmar Town Hall, are proud to serve the citizens of our municipality and we continue to try to do our best to make your government responsive, efficient, and progressive. We welcome your thoughts, ideas, comments, and even your complaints, because they all contribute to the success of our combined efforts. By working together, respecting one another, and sharing the pride that is part of our "Town Too Big For One State", we can look forward to a positive future filled with pleasure and prosperity for all. We wish you the very best as you become part of our community and we hope that you will feel a part of our family of Delmar residents. On December 10, 2011 the Town Officials hosted a ribbon-cutting ceremony to officially dedicate the new home for the Town's Municipal Building. The Town Hall renovation project was a major undertaking to convert the Bank of Delmarva building into a facility with a floor plan that would accommodate our governmental needs. One significant change that occurred as part of the remodeling project was the relocation of the building entrance to the west side of the structure facing Pennsylvania Avenue. The Town received grant funds from Efficiency and Conservation Block Grant which provided many high-tech features to ensure our new facility is energy efficient. This project was funded by local and federal funds. Delmar's new state-of the-art wastewater treatment facility was unveiled on December 20, 2011 at a ribbon-cutting ceremony that included dignitaries from Delaware, Maryland and the U.S. Environmental Protection Agency.The facility was originally built in the late 1980's; the plant was expanded to treat 30 percent more wastewater than the old treatment facility. A total of 850,000 gallons of wastewater per day which will meet the capacity needs of Delmar now and into the future. The facility was upgraded to include the addition of biological and enhanced nutrient removal systems that effectively reduce pollutants-nitrogen and phosphorus loadings from entering the waterways that drain into the Chesapeake Bay. This project was funded by local, state and federal funds. Delmar Town Hall is located on South Pennsylvania Avenue along the railroad track that has become a vital part of our history. Regular business hours are from 8:00 a.m. until 4:30 p.m., Monday through Friday. Our mailing address is 100 S. Pennsylvania Avenue, Delmar, Delaware/Maryland 21875. The phone number is (410) 896-2777 or (302) 846-2664. Our FAX number is (410) 896-9055. Our e-mail address is delmartownhall@verizon.net. Delmar is two incorporated towns: Delmar, Delaware, governed by a Mayor and four council members is located in Sussex County and Delmar, Maryland, governed by a Mayor and four commissioners, is located in Wicomico County. The Towns share a central administration, police department, public works department, and sewer/water facilities that are jointly owned and operated. 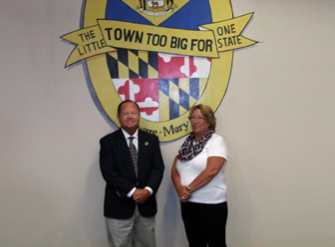 Mayor and Council of Delmar, DE First Monday at 7:00 p.m.
Delmar Utility Commission First Monday at 6:30 p.m.
MD Board of Zoning Appeals Last Tuesday, 7:30 p.m. Parks and Recreation 1st Tuesday, 8:00 p.m.
Planning and Zoning Commission Thursday before the last Monday at 7:00 p.m.
Little League Board 2nd & 4th Tuesday, 7:30 p.m.
DE Board of Adjustments 3rd Tuesday, 7:30 p.m.
Police Commission Second Monday at 6:30 p.m.
Delmar Revitalization 3rd Wednesday, 7:30 p.m.
Public Works Commission First Monday at 6:00 p.m.
All of the Town's boards, council, and commissions comply with the open Meetings Act.